Hanging from a capsized kayak, my body upside-down and under water, I was torn between exhilaration and panic. In the dark water of the river, I couldn’t see a thing. Time seemed to freeze as I held my breath, wondering how long I would be in this position. Just as I found myself edging more toward panic than exhilaration, my kayak was flipped right-side up. I felt the sun on my face as I breathed in a welcome burst of fresh air. Panic disappeared and exhilaration hit! This was how my wildest day since moving to Illinois began. Actually, it had begun about an hour earlier. A few of us travel writers had come to Yorkville, not fully understanding what we were in for. We started with a leisurely breakfast at Ginger and Soul, then walked over to Bicentennial Riverfront Park where we were met by Kayak Instructor Jeff Brown of The Yak Shack. Jeff outfitted us with kayaks, PFDs (personal flotation devices), paddles, helmets and “skirts” (which keep water out of the kayak; especially useful when capsizing! ), then gave us a short safety briefing. With those formalities and necessities complete, we carried our kayaks down to the water’s edge and prepared for our first practical lesson: water exits and rescues. It was vital, Jeff insisted, that all kayakers feel confident in self-extrication and other water rescues, in the event our kayak capsizes, which, he reminded us, was pretty likely in whitewater. I volunteered to go first, knowing that I might just get more nervous if I waited any longer. And that’s how I found myself upside-down. Under water. Hanging from a kayak. Teetering between excitement and fear. It was the first of many similar moments in the day-long crash course in whitewater kayaking. Over about six hours on the water, we practiced safety skills and paddling maneuvers again and again, with a welcome mid-day break at Southbank Original Barbecue, right along the river. “The course” is the Marge Cline Whitewater Course on the Fox River in Yorkville. At 1100-feet long, this man-made channel offers several choices of routes for kayakers and canoeists. 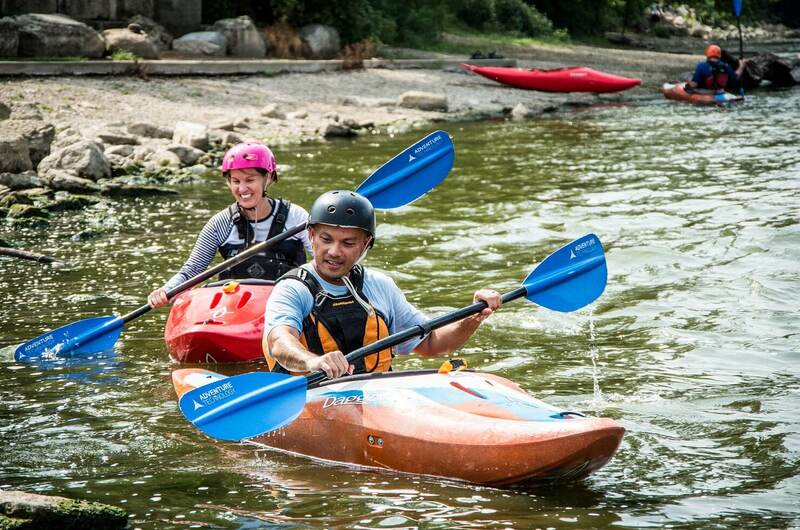 Beginning paddlers can enjoy more conservative features from flatwater to class II rapids. Under ideal water and weather conditions, more advanced boaters will be happy to find more class II’s and even an occasional class III section to paddle. After we capped off our day-long crash course in whitewater kayaking with a victorious run down the Marge Cline, we left the river behind and headed a block off the water for burgers and beers at Crusade Burger Bar. We toasted our day of challenges and accomplishments, fears and thrills. And while some of our group felt like once was enough, a few of us vowed to return one day to face the river again. Julie Ap is the founder of Open Wide the World, a travel website centered on the premise that “knowledge enriches travel and travel enriches life!” When Julie and her family are not researching and writing about destinations in the Aurora and Greater Chicago areas, they can be found camping, hiking, boating and traveling all over the Midwest and beyond. Ready to test yourself against Class II rapids in Yorkville? Prepare with Julie's blog, "5 Tips to Crush Your First Whitewater Kayaking Lesson."